Calendar making, by its very nature implies basic assumptions, one of which is that it conditions our way of thinking and doing. Based on the research, teachings, and constellation calculations undertaken by Maria Thun, the Celestial Planting Calendar offers an intricate yet simplified understanding of the solar, lunar, and planetary rhythms, which enables readers to develop their own understandings and awareness and facilitates their participation in this cosmic dance from an agricultural perspective. 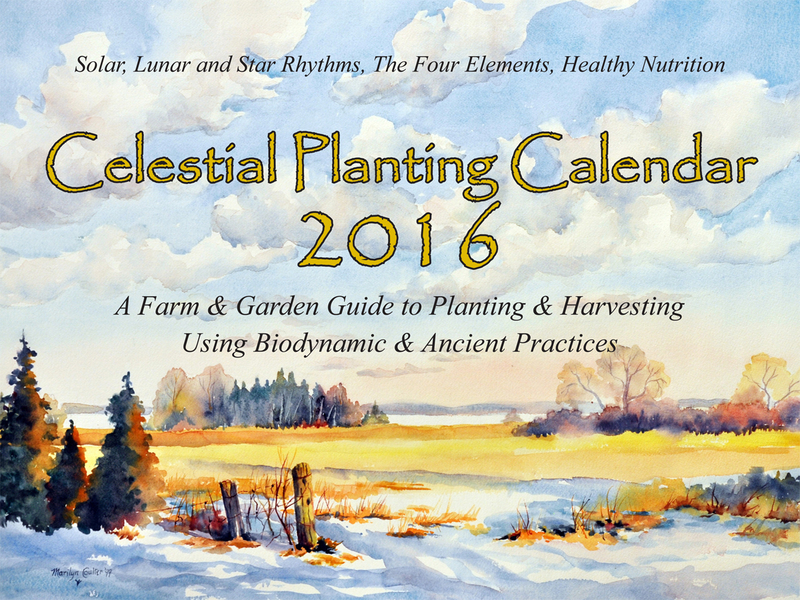 Geared towards biodynamic and organic farmers and gardeners, this calendar is blended with breath-taking art that captures the bright, clean colors of nature, as well as the minutia of daily planetary aspects, lunar cycles, appropriate times for applying biodynamic preparations, and monthly night sky events. This information is clearly presented and includes monthly color-coded charts of the moon's journey through the constellations. The document also has educational articles on a wide range of topics. This particular edition highlights nutrition by way of connecting with the microbial forces in the human gut. It also considers how compost builds upon the microbial forces that transform raw materials into soil. Another theme includes insights, inspirations and key lunar times for working with wood. While the calendar is readily used by beginners, it has the added feature of taking the advanced teachings of George W. Schmidt into consideration. George Schmidt and his father, Martin Schmidt, had both devoted decades of research to optimize the production of grains such as oats, wheat, and rye, based on planetary alignments. The English translation of the report summarizing their seed regeneration research is available on our web site. 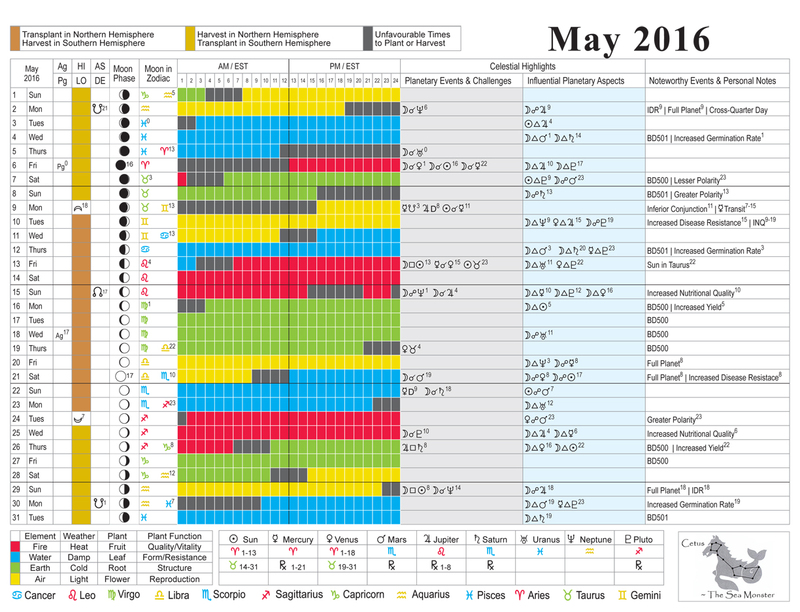 These influential planetary alignments are incorporated into the monthly charts on a daily basis and are applicable to a range of agricultural practices. The reference guide at the back includes detailed graphic and written explanations of how to work with the monthly color charts. Such subjects as moon phases, various lunar cycles, retrograde motion, and basic astronomical aspects such as conjunctions, squares, trines and oppositions are clearly described. In designing this calendar, it is the intention of the authors and publisher to encourage readers to develop their own sense of awareness and powers of observation. Undertaking such daily activities as planting, hoeing, harvesting, and working the soil at times that have been determined as being optimal based on decades of biodynamic research, one gains a sense of attunement and connection with the cosmos. 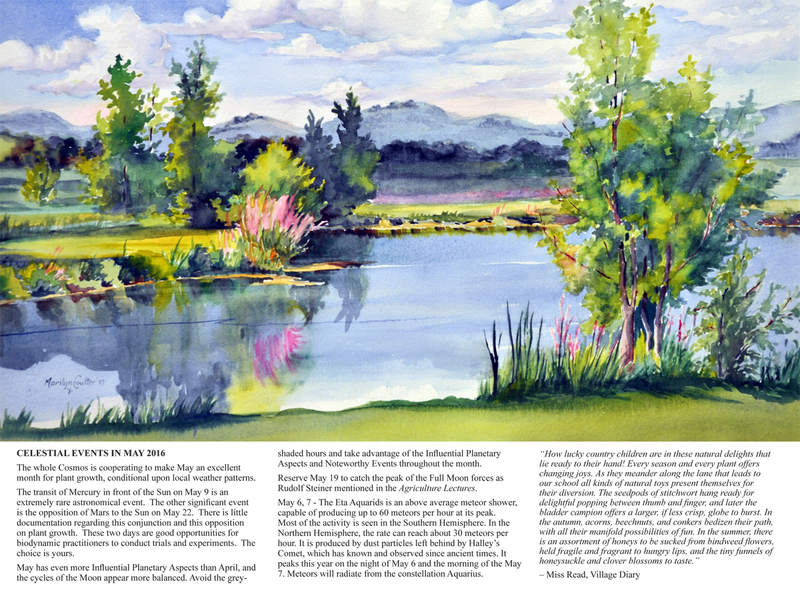 Another form of participation is the incorporation of nature scenes that are showcased each month above the color charts. This year features the art of Marilyn Coulter who clearly portrays her passionate enthusiasm to record nature as she sees it. The publisher invites artists to submit samples of their art for inclusion in future calendars. In summary, by blending astronomical and agricultural details with art, poetry, and wisdom from the elders, the goal is to open our hearts and minds to subtle spiritual and physical forces that are present on an ongoing basis. Calendars can be ordered online at www.planting-calendar.com or through www.amazon.com or www.amazon.ca.